You know when it happens – but only after the fact. You’re absorbed in the writing, the words are pouring out, and suddenly you realize that an hour or two has passed. It’s as if you wake up from the work. Instead of feeling drained, you are energized. Performers and athletes talk about being “in the zone.” Psychologists call it flow. Whether it lasts minutes or hours, writing in a state of flow is wonderful. The main thing most people want to know about flow is this: How can I get more of it? If we could choose, we would always write this way. Even if you don’t find it often when writing, you might experience flow in other parts of your life. Perhaps you get absorbed in the work when gardening, painting, or practicing an instrument. You might even (wait for it) find flow in the workplace, when editing a paper, writing code, or analyzing data. What if your day job included work that you found absorbing and inherently rewarding? Flow is the ultimate employee benefit. Good news: We do have some control over when and how flow happens. It’s not just a matter of chance. Here are two things you can do today to increase your chances of working in flow, no matter what kind of writing you’re doing. Most of us can structure our work and our working environments in such as way that flow is more likely to happen. Eliminate distractions: Flow requires focus, so tune out potential distractions when you want to work in flow. Shut down apps, silence the phone, close the door. Check your mindset: One of the preconditions of flow is a lack of self-consciousness and fear. When writing, one way to silence fear is to break the work into phases. Tell yourself that you will take another pass or do a careful revision before you show the work to anyone. This helps you set aside fear or self-consciousness when drafting. Externalize time management: When working in flow, you lose track of time. That’s a problem if you have scheduled commitments. If you’re going to have to go somewhere, set an alarm. Then you can work without watching the clock. Like anything else, writing in a state of flow gets easier with practice. If you’ve read The Writer’s Process or my past posts about the Muse and the Scribe, you can imagine that flow is the point at which these two competing parts of our inner selves work together. It’s a delicate balance. To get improve this real-time collaboration, practice writing in flow with a non-critical project. Open a file and start writing about any topic. You might sketch a personal story, thoughts on a work-related project, or an email you plan to compose. Try to write fluidly for a certain period of time or number of words. Get your inner Muse and Scribe accustomed to working together. Try doing this every day for a month as a writing warm-up. 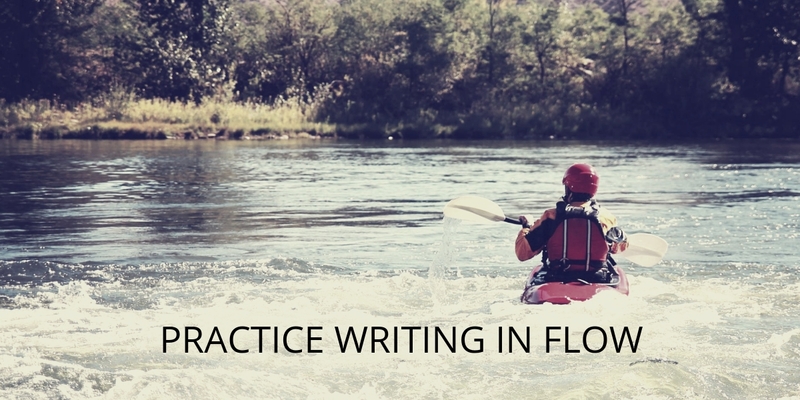 This daily practice is one way of rehearsing writing in flow. Chris Syme and I talked about flow in this Smarty Pants Book Marketing podcast on balancing creativity and productivity when writing.